Since putting this on the Web, I have found that essentially the same proof is given by A. Letac in Sphinx: revue mensuelle des questions récréatives , 9, 46 (1939). 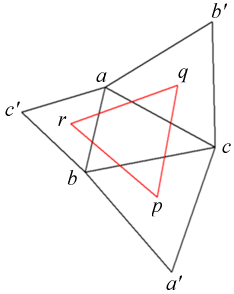 Let the angles of triangle ABC be 3α, 3β, 3γ and let PQR be the Morley triangle (see diagram). To prove: that PQR is equilateral. Hence QR=4sinαsinβsinγ, and the result follows by symmetry. 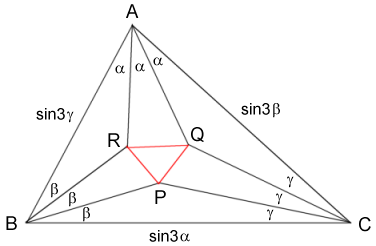 Hence also the well-known result that the side of the Morley triangle is 8Rsin(A/3)sin(B/3)sin(C/3), where R is the circumradius of ABC. Points in the Euclidean plane can be identified with complex numbers, and it is well known that this leads to quite a neat proof of “Napoleon’s” theorem (see below). Can Morley’s theorem be proved by the same approach? Before tackling Morley’s theorem, we recall how these ideas can be used to prove Napoleon’s theorem. Let a,b,c be an anticlockwise triangle and let a′,b,c etc. be equilateral triangles on the outer sides of triangle a,b,c and therefore running clockwise. Let p,q,r be the centres of these equilateral triangles. The theorem states that triangle p,q,r is equilateral. The following proof of Morley’s theorem is similar but more complicated. Let triangle a,b,c have angles 3α,3β,3γ as in the first proof. W.l.o.g. we may assume that a,b,c is anticlockwise with circumradius 1, and that a=1, b=cis6γ, c=cis(−6β). Let p,q,r be the Morley triangle. The terms on the right cancel in pairs. Hence p,q,r is an anticlockwise equilateral triangle, q.e.d. By a direct proof I mean one that does not make the Morley triangle equilateral by construction and then deduce that certain lines are trisectors. A direct geometrical proof is not easy to find. The following two-part proof is essentially due to Taylor & Marr (I have changed some details). BU ⋅ CV ⋅ WA = AC⋅RF ⋅ BA⋅PD ⋅ CB⋅QE = 1. Hence AP, BQ, CR are concurrent by Ceva’s theorem. Let BR, CQ meet at L, and define M, N similarly. Since AP, BQ, CR are concurrent, the six lines AQ, AR, etc. 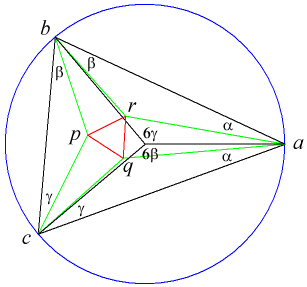 are tangents to a conic (converse of Brianchon’s theorem). Hence (direct form of the theorem) LP, MQ, NR are concurrent at a point O, say. This fact is the key to Part 2. We now assume that α=A/3, β=B/3, γ=C/3. Let LP meet BC at G. By the angle bisector theorem, BL/LG=LP/PG=CL/LG. Hence BL/CL=BG/CG. Hence LP bisects the hexagon angle RLQ. Similarly for MQ and NR. Straightforward angle-chasing, along with the relation α+β+γ=π/3, now shows that the angles in the hexagon PNQLRM are as in the diagram. From congruent triangles (e.g. OLQ, OLR) we have that OP=OQ=OR; and since these lines make angles of 2π/3 with each other, the Morley triangle PQR is equilateral, q.e.d. It is possible to avoid the appeal to Brianchon’s theorem by using trigonometry, but I could not find a proof by elementary geometry.